3M Desk Mount Arm for Monitor, 18 x 14 x 5. 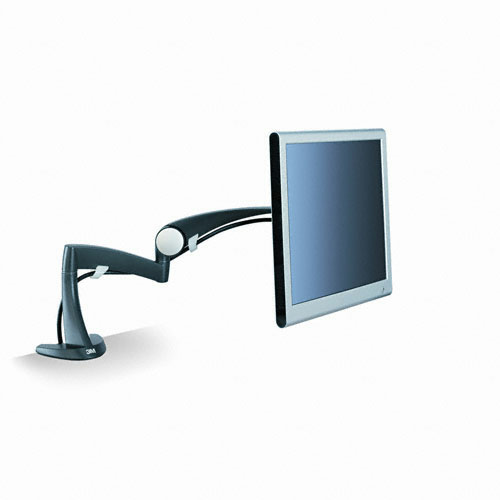 Free up space on your desk and set your LCD monitor at the best ergonomic position. Highly adjustable arm moves up, down, forward and back. Height adjusts up and down through 8" range at 6 fixed positions. Monitor can rotate to portrait or landscape. Swivels 180° and tilts forward and back 180° for optimal ergonomic positioning. Clamp mount system for desks up to 1-7/8" thick. For monitors up to 18 lbs. Fits both 75x75 mm and 100x100 mm VESA-D monitor bolt hole patterns.